Okay, after I finished the little stroller blanket I remembered another pattern I had that had hearts in it. It was a pattern that was on a reader sheet that was with my machine when I bought it so I don’t know who the author was. Anyway , I took the blocks and made them larger and then arranged in the same configuration as the stroller blanket. I love it even more….or maybe it’s the color. lol I think it would be pretty in aqua and also one in yellow. Don’t know if I would do in blue for a boy but maybe change the design in the blocks. Maybe a teddy bear or a train. The blocks are larger and so is the blanket. The finished measurement of this one is 29 inches in width and 30 inches in length. Feel free to make this even larger if you want. I put this pattern file in the same folder as the stroller blanket and a small written pdf file telling you to cast on 156 stitches and 142 rows(568 knitted rows). I also put in a bmp, png and tif file. Check the design on the tif file since my computer said something about the file being larger the way I converted it. 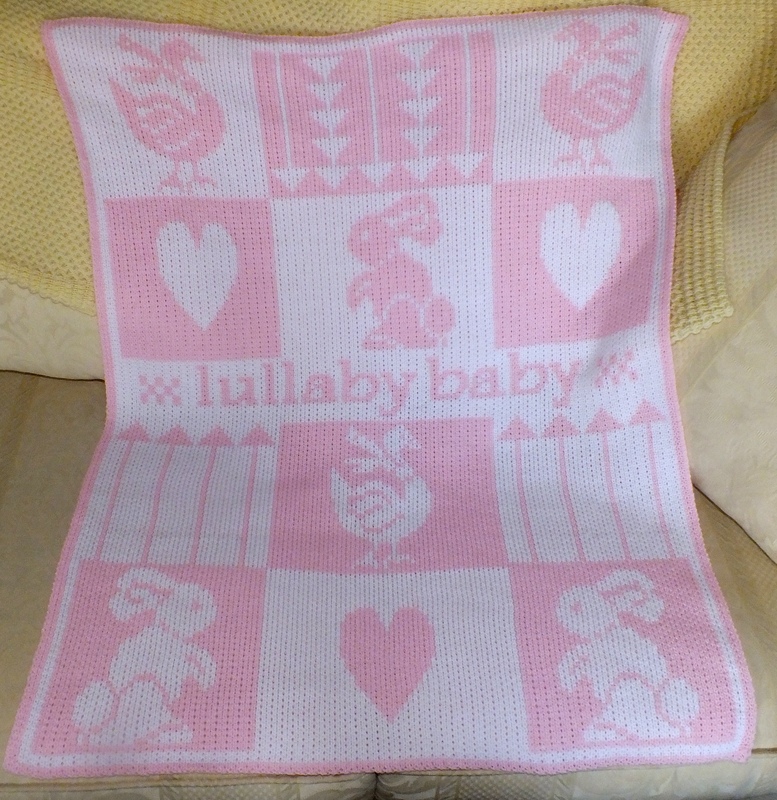 After I made the first afghan in blue I sort of thought the bunny and the bird might have been too girly for a boy. So I went in and changed the designs in the blocks and came up with Precious Baby. The cut file is in the drop box that lullaby baby is in. I also added two more columns on each side of both afghans so the border is a little wider and it looks perfect. You can take this file and open it in win/crea and change the animals to anything that you like. They are anywhere from 25 to 30 rows if you are looking for new designs. I also knitted the pink afghan at 5.25 on both beds and it was too loose on the back bed. So I used the tension of 5.25/5 The afghan did not come out that much larger because of adding columns. I do like the size though. I just finished this baby blanket for a co-worker’s daughter. I blocked the date for privacy. She did not want baby colors. A lot of women are going that route. I always worry that they won’t like it but she did. I used four colors, two strands of 2/24 for each color. The white is an off white so it was not a bright contrast in colors. I used 179 stitches and 138 rows(which comes to 1104 rows) The afghan was 36″ by about 43″. I used tension 5 on the front bed and 4.. on the back bed. I used mast settings of 5.5 on the first two from the left and 6 on the right two masts. 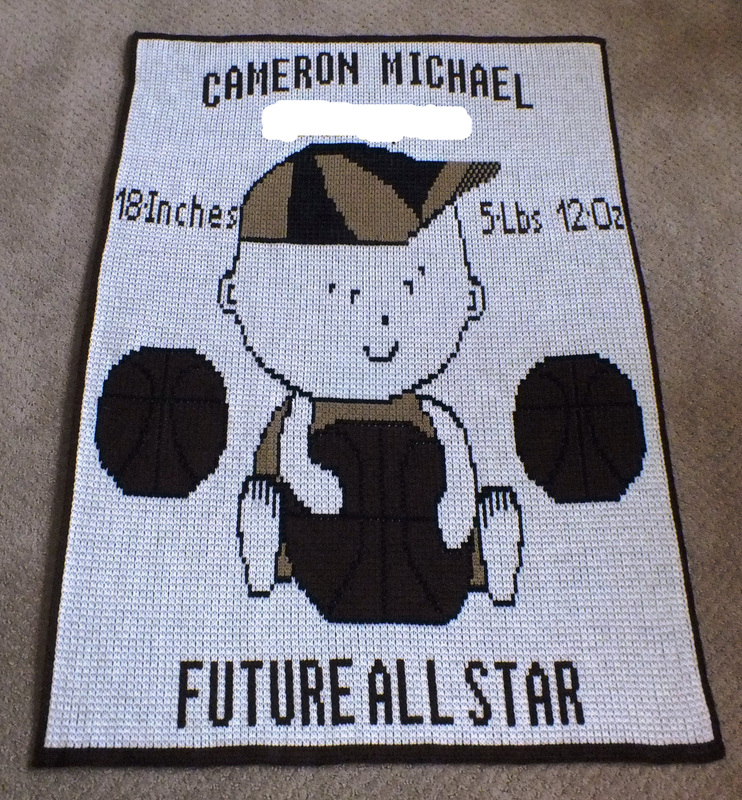 I made an afghan for my nephew’s first child and it had his name on it. Now his wife is pregnant with a girl and I just now decided that I better do something and the shower is Saturday! Her colors in the room are pink and purple and green and decorated with butterflies and flowers. I had the pink, dark pink and purple but did not have the lime green in a 224 so I did not want to do a four color with the wrong green. 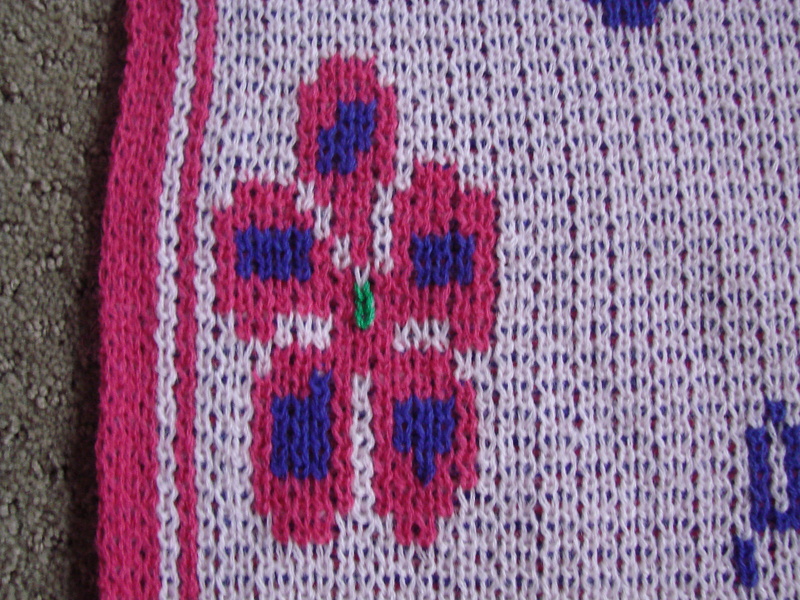 I found a green in cancun and I will duplicate stitch the centers of the flowers to add a little more color. I did that in the second picture. I only had two hours last night to design this and 3 hours this morning to knit. I still have to bind off the top but took it off on waste yarn and can do that in an evening. I am not crazy about the afghan and I should have known by turning the butterflies that they would look elongated but I have to tell you that there is not one mistake, no pusher problems and I will tell you what my settings were. Tension masts were all set at 6. Two strands of 224 for each color. The cast on was TD 3, CX rows were 4 and the N/N row and final tension for the afghan was 4… on front bed and 5. on the back bed. The afghan is 180 stitches by 190 rows using technique 199. The only time I had to stop was to add yarn when second cone ran out. I was in a hurry to take picture because I have to leave the house but it is a really pretty pink for the main color. It almost looks white in the picture. I was supposed to be making a stroller blanket. 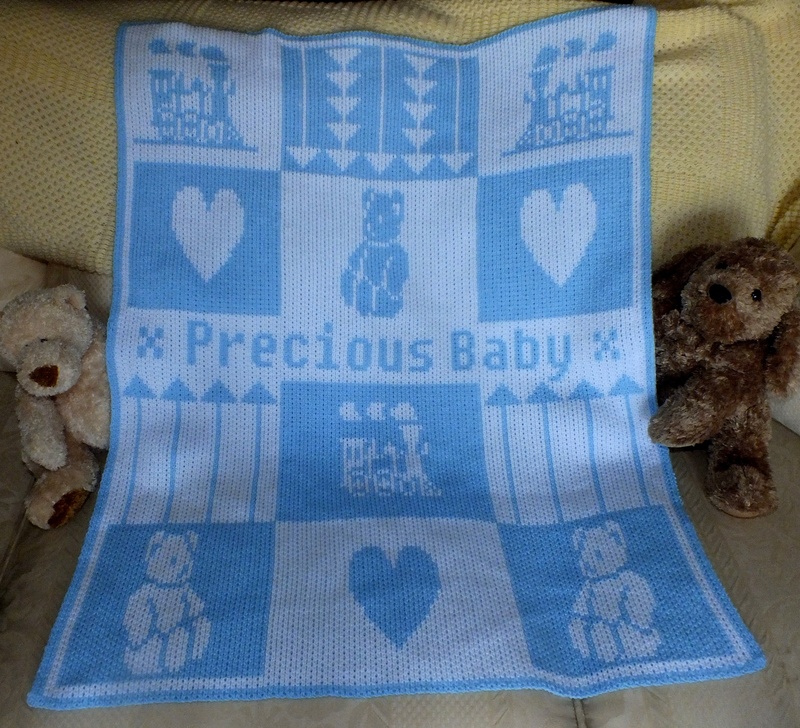 I took this pattern that was larger and personalized and made it a baby blanket. 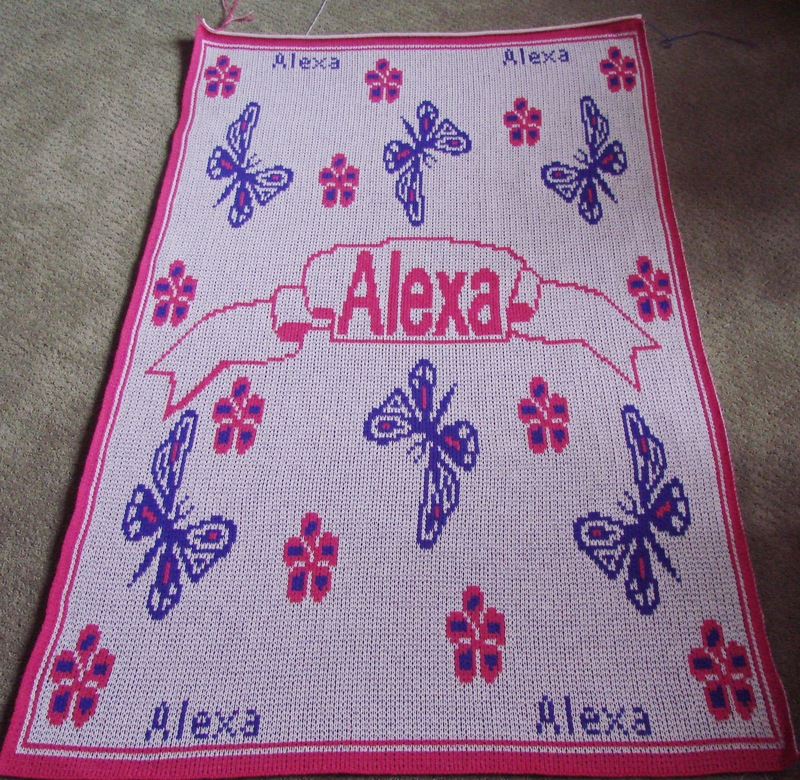 It is 163 stitches wide and was 636 rows. I used technique 183(LX/N). Since the expectant mother did not want blue colors for a boy, I thought this would be nice. These colors are cream and tan. The cream is the same color I made the sweater and the afghan lovely in. The size is roughly 29 inches by 38 inches.. 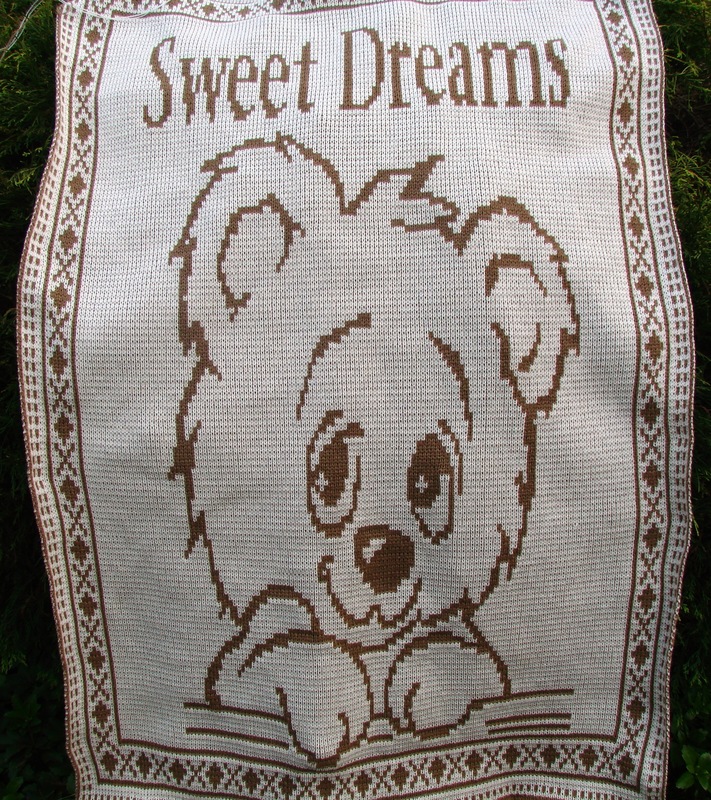 If I had taken out more rows above the words “Sweet Dreams” the side borders would not have matched. I also did not want to fool around with the bear design because he is in proportion. One other thing to do would be to make the lettering smaller so I could take an additional 10 rows out but I think this will be okay. Now that I finished this I can go back to having fun playing around with new ideas for knitting and felting.